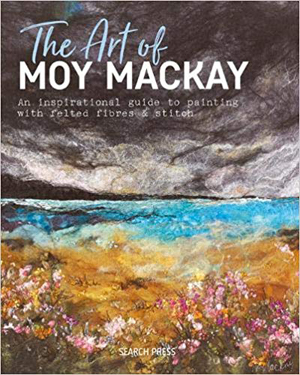 From inspiration and design to the finished vibrant picture, learn to become the felt artist you've dreamed of becoming through this book by bestselling author and renowned felt artist, Moy Mackay. From concentrating mainly on the felting techniques described in detail in her previous books, this latest title by the popular felt artist now shows you how to find inspiration for your own felt painting creations, helping you to develop your own original ideas. Delve into the catalogue of Moy's beautiful, colourful sketche books and photographs and learn about her own design process and influences, through which your own artistic abilities can be ignited and explored. With each page Moy takes you through every step of her felted painting process, including the materials and tools you need, the process itself (which is easier than you’d imagine), and how to put together four fabulous paintings of varying subjects all of which Moy has devised to give you the basic knowledge to eventually design your own felt creations. There is also guidance on stitching both by hand and machine as well as how to use colour and introduce texture in the form of different fibres and threads. There are numerous examples of Moy’s work throughout the book, evoking the dramatic scenery of the Scottish Borders where she lives and works, providing further stimulation for your own gorgeous felt paintings.